At the core of their newly built one-story home, an Illinois couple’s kitchen shows off their warm personalities. “I’m trying to find the right words to describe it,” designer Anne Boedges, owner of Anne Marie Design Studio, processes aloud. After more than a year of working with Charles and Linda Poettker on their new and—now complete—O’Fallon home, she doesn’t think it’s fair to categorize the couples eclectic style. Defined by its unique shape and layout, the textures and elements are what catches your eye in the Poettkers' kitchen. “It’s like a fine bottle of wine”, the words Boedges would prefer to use in describing the style. While bright and buttery, the kitchen is also dense, elegant and earthy, which brings a complex and intellectually satisfying appeal to the room. "It’s refined, opulent, toasty and velvety," she adds. The elemental balance eloquently highlights the personality of the homeowners for an inspiring and cohesive arrangement. "Its just them," she says. "Comforting and warm." Though their working relationship would include the one-story home in its entirety, Boedges stresses that the kitchen—the Mediterranean-eclectic-contemporary kitchen—is the heart and soul of the Poettker home. 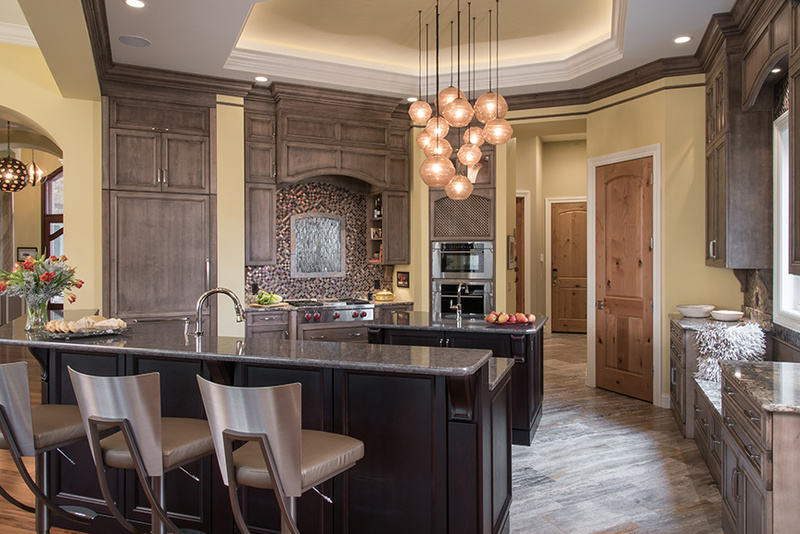 “They really loved the centrifugal design that made the kitchen the center of the home,” says Boedges. 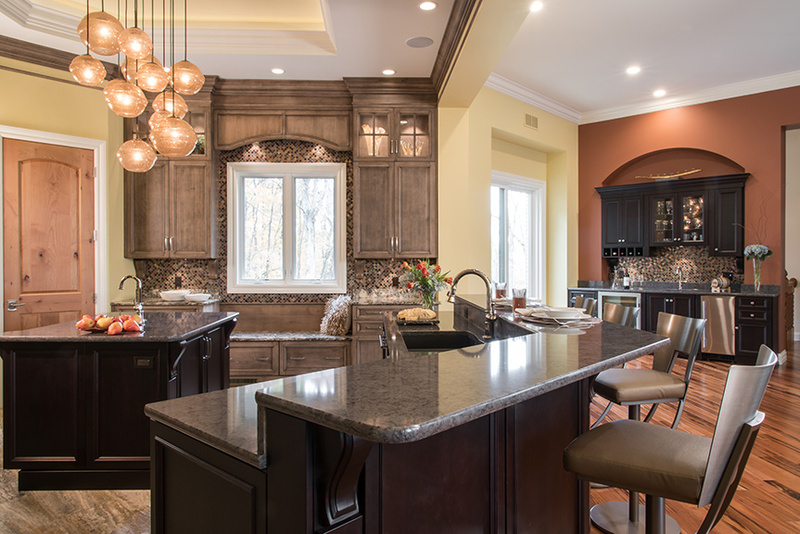 With it’s uncommon circular layout and floor-to-ceiling cabinetry, built and installed by Markus Cabinet Manufacturing of Aviston, IL, the kitchen is a grand culmination of ideas and hard work from small businesses and long-forged family ties. “From the lead general contractor to Brendel Architects to the journeymen and crew, lots of family friends and close relatives brought their high skill set to the table. It was really a group effort,” Boedges explains. And it shows in the blend and balance of the space. Boedges worked with Markus to create a one-of-a-kind stain that is warm and earthy, like a morel mushroom, for the alder wood cabinets. The same wood and glaze camouflage the Sub-Zero fridge and freezer, fabricating an illusion of visual continuity. 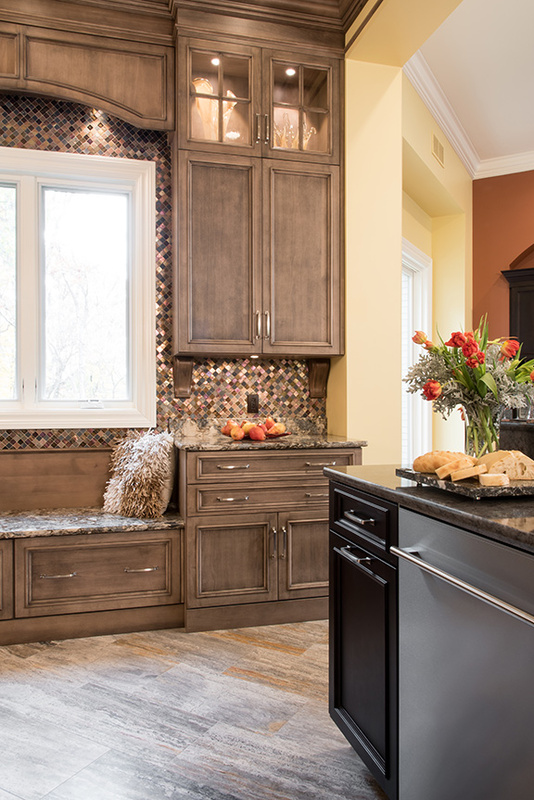 Earth-toned reds and browns create a calming base that allows the sheen of the intricately tiled black, brown and cream backsplash to pop and play. Unconsciously, the eye travels from top to bottom. First from the warm can lights in the tiered white ceiling, down the cabinetry inset with delicate latticework and sharp, angular bevels, to the travertine-tiled floor veined with deep brown over fields of neutral cream. 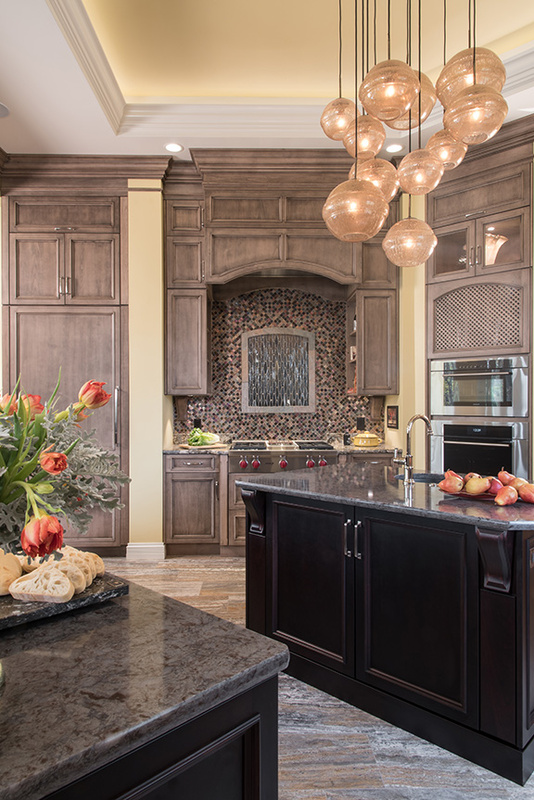 The island, serving as both a boundary to and extension of the kitchen, is a burgundy blend of reddish-black quartz that grounds the room and calls attention to the true showstopper.